Humans are actively destroying the coral reef ecosystems on our earth. Reefs are overfished, bombed and poisoned, smothered by sediment, and choked by algae growing on nutrient rich sewage and fertilizer run-off. They are damaged by irresponsible tourism and are being severely stressed by the warming of the world's oceans. Some 58 percent of the world's reefs are reported as threatened by human activities. Poverty and overpopulation The key threats to today's coral reefs are poverty and overpopulation. Hungry people don't care about conservation! Coral reefs support the livelihoods of millions of people, but for how long? Human populations are increasing and today especially reefs in developing countries are seriously threatened. Lack of political will Despite declarations aimed at stopping illegal fishing or the live reef fish trade, there is little political will and insufficient incentives favoring conservation and even less for enforcing the rule of law. Voters should influence politicians to change this shortsightedness. Constructions along coasts is often done with materials removed by dredging and dynamiting from the living coral reef. Construction will often result in heavy sedimentation and siltation. Corals are not only removed for construction material but also sold as souvenirs. The coral harvesting business and urban development (for example for tourism) are some of the major threats to coral reefs. Deforestation, mining or farming upstream and logging in tropical forests result in large quantities of sediment and soil going into coastal waters and onto coral reefs. This dirt, silt or sand can make the water cloudy or muddy, smothering the coral which then can't get enough light to survive. Slash-and-burn agriculture and the use of fertilizers are the cause for an increased nutrient flow into reef water. Human sewage also flows into coastal waters and leads to the rapid growth of algae which chokes coral polyps, cutting off their supply of light and oxygen. Trash dumped into the water can also kill coral reef life. Plastic bags are often confused with jellyfish. Turtles and some fish swallow these bags and because they can't digest them, the bags block their digestive tracts, causing the animals to starve to death. With modern fishing equipment, outboard motors and refrigeration, most coral reefs within range of transportation are commercially exploited. As nearby stock becomes depleted, the fishermen have to go farther and farther away to get their catch. This leads to over fishing and larger and larger areas being depleted. Coral reefs are often dynamited to harvest small fish. Although it is illegal, it is practiced in many countries worldwide and is a major threat to coral reefs. This destructive fishing methods uses bottles filled with explosives made from potassium nitrate (a common fertilizer). The explosives create an underwater shock wave that ruptures fish swim bladders so they float to the surface where fisherman can easily collect them. Not only fish are killed but also other inedible reef animals. Often a certain reef area is dynamited twice, first to kill the smaller fish, then again to kill the larger predators attracted by the carnage. But the most damage is caused by the destruction of the corals by the blast, reducing the surrounding area to lifeless rubble. These areas don't recover very fast, because larvae have a hard time to find places to hold on in this kind of rubble. Fish will reproduce to fill the environment - coral is the environment! Of course these methods are illegal but enforcement is difficult in remote areas and often lax. You can help by refusing to eat fish that have their swim bladders ruptured and are clearly caught by blast fishing. Fisherman often use potassium cyanide and other poisons to stun and capture valuable reef fish. Divers squirt a cyanide solution from bottles directly onto fish resting on corals, killing the corals and stunning the fish. The fish often escape into crevices and the fishermen have to break apart the coral to get to their paralyzed prey. With this technique not only the fish are poisoned, but also the coral polyps and other creatures in the area. Places where cyanide was spread will first form black slime, then they will just become dead coral rock. This method is used to catch tropical fish for aquariums or to capture valuable fish such as the Napoleon wrasse or groupers for "live fish" restaurants. Of course not all fish survive, it is said that 40% of exotic fish die before they reach the aquarium. Exports of these animals are often formally banned but nether the less done everywhere. According to Interpol the illegal trade in wildlife and wildlife products ranks second only to drugs in terms of financial rewards. Some fishes such as seahorses prove very difficult in keeping in an aquarium and suffer high mortality in captivity. The keeping of marine ornamental fish is a widespread hobby, but a aquarist should first find out which species are appropriate for captive systems, which species are rare or endangered and which should best be left on the reef! In many Asian countries consuming of certain marine products are said to give you heightened sexual capacities. Some marine species for example seahorses, are dried and used in traditional medicine. Of at least 20 millions dried seahorses traded globally (1995), the vast majority was for the use in traditional medicine. Sharkfin soup is delicacy in Asian cuisine and is offered at many banquets or weddings. Some believe that the shark fin is also an aphrodisiac. But nowadays sharkfin soup is not a rare treat anymore but it is consumed in much larger quantities and even found canned on grocery shelves! Sharks are caught on hooks, reeled in and the fins are cut off. The still living shark is then thrown back into the sea where they are eaten by other sharks or flounder for hours before suffocating, unable to use their gills to breathe and without fins to propel them through the water. Fish and prawn farms Specially threatened are coastal mangrove and seagrass areas which are the breeding ground for fish. These areas are converted into prawn and fish farms. Since mangroves and seagrasses normally act as filters for sediment, much more sediment can reach the coral reefs doing damage. When people grab, kick, walk on, or collect coral, they also contribute to coral reef destruction. Careless boating, diving, fishing, and other recreational uses of coral reef areas can cause damage to them. On some islands the resorts use dynamite to create a passage for their boats. If here are no buoys, anchors are dropped which crush or break corals. Good meaning tourists feed reef fishes, but this results in changing their feeding behavior and don't graze on algaes anymore which can choke the corals. Polished shells, clams and Nautilus shells, jewelry made from shell or tortoiseshell, pictures with dried seahorses, ashtrays made from clams - don't buy these souvenirs! 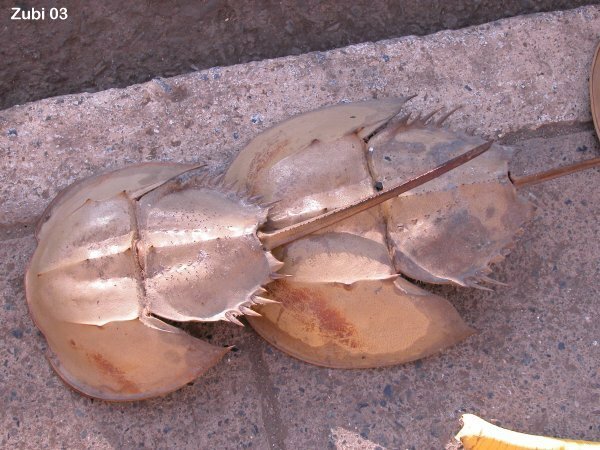 These animals are specially caught with nets or bait and not just found on the beach - they are much too pretty and clean! 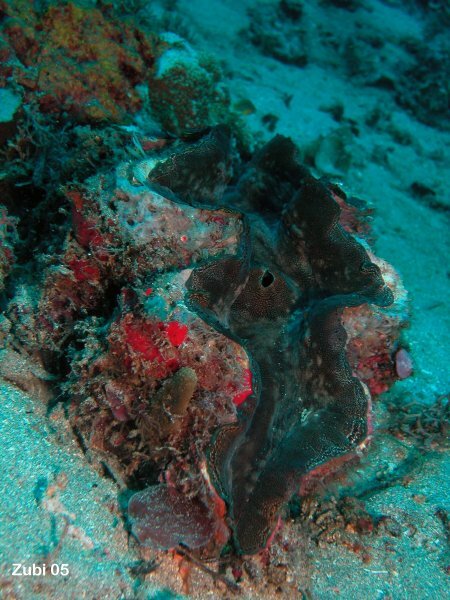 Some animals such are the giant clam (Tridacna) or marine turtles are protected by law and you can't import them into your country! We divers all want to conserve the beautiful reefs we are diving in. But the increasing popularity of scuba diving has also put more strain on coral reefs around the world. Divers, specially underwater photographers and beginners sometimes make contact with fragile corals, breaking them or damaging them and leaving them susceptible to bacterial attack and disease. Boat anchors from dive boats also contribute to the damage caused by recreational diving. In my opinion dive operators also should not tolerate scuba divers who are spearfishing for fun. As a diver you can help by choosing dive operators who support environmental initiatives. Reefs were used to test atomic bombs. Huge areas were flattened and poisoned for a long time by radioactive substances. For example the Bikini-Atoll (1946 ) was the location of 23 atmospheric atomic bomb tests from 1946 through 1958! Oil spilled by leakage or from ships cleaning their holds floats on the water and pollutes large areas of the ocean. Petroleum products and other chemicals dumped near coastal waters eventually find their way to the reefs and poison coral polyps and other marine life. The same amount of oil can do more damage in some areas than others. Coral reefs and mangroves are more sensitive to oil than sandy beaches or seagrass beds, intertidal zones are the most sensitive. How can we save the reefs? One of the steps that should be taken immediately is the creation of marine reserves off limits to fishing. About six percent of the world's land is in parks. But at sea, less than one-half of one percent is in any kind of protected area. At the same time we will have to develop alternative livelihoods for fishers and regulate the trade in live reef fish and other threatened marine animals (corals, clams, turtles etc.). The answer lies in economic diversification and in non-consumptive uses of our marine resources. The Washington Convention on International Trade in Endangered Species of Wild Fauna and Flora (CITES) lists relatively few marine species. This should change and more species should be protected by international law. You can either choose to contribute to the continued decline of marine life or play a positive role in preserving our aquatic natural resources. For example by not eating or purchasing turtle eggs or meat and shark fin soup, you will decrease the demand for these products and therefore the need for the supply. Choose pelagic fishes like tuna and mackerels or aquacultured fish (Napoleon and lobsters are not aquacultured!) and avoid eating reef fish altogether. As a marine fish hobbyist you can choose more robust aquarium species from sustainable sources instead of buying fish caught in coral reefs. As a tourist you can avoid buying curios made with the dead remains of marine creatures such as shells, dried seahorses or dead corals. Also tell people not to walk on corals - they often don't know corals are living animals or that they brake them by walking on them. As a consumer you can choose to buy items with less packaging, generating less trash and recycle whenever possible. Get educated and share your knowledge! Tell others about life in the coral reefs and their importance to future generations and about conserving the marine resources.